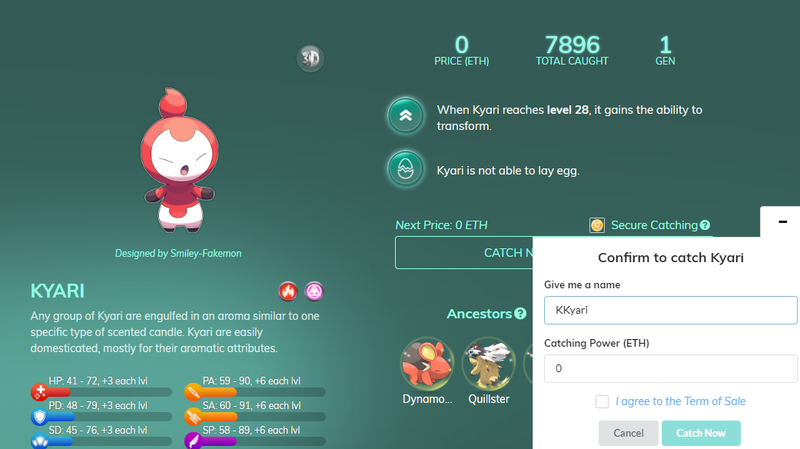 Etheremon is a crypto game built on the Ethereum network. In the world of Etheremon, players are allowed to capture, buy and train Ether Monsters to build a unique Etheremon collection. The more you train your Ether Monster by battling opponents, the faster it levels up. Each monster can lay eggs and evolve into a new species that gains value. In this game, players try to accumulate experience points for their monsters so that they can transform the monsters into new species, then sell or lend them to other players. With more than 482 Daily Active Users, Etheremon is considered one of the most popular decentralised apps ranked on Dapp.com. As of the time of this writing, it ranks #21 in All Categories and #10 in the Game category. Let’s jump into the world of Etheremon and capture some Ether Monsters! Setting up an account with Etheremon is an intuitive process. Simply install Metamask on your web browser, either Chrome, Firefox or Opera. 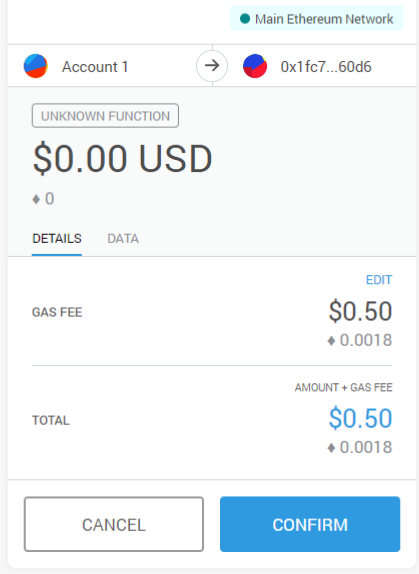 This enables you to connect your Ether wallet to your web browser and easily conduct transactions in the game. Learn how to use Metamask here. After you set up your Metamask account, head to the Etheremon website and sign up! After successfully logging into Etheremon, you will need to catch some monsters to play the game. Click on the “Official Store” on the tab above. At the start of your Etheremon journey, you receive 3 free Ether Monsters: Mintol, Kyari and Omnom. I’ll catch Kyari first! You can give it a name that you like and agree to the terms of sale to catch it. Although the monster is free of charge, you are still required to pay a small transaction fee, called gas. If the free Ether Monsters are too conventional for you, you can purchase different types of monsters from the official store. Due to scarcity, certain monsters are no longer catchable. However, you can find them on sale in the market. In addition, new monsters are continually being released. If you can’t find any monsters you like, just wait for some new monsters to show up. 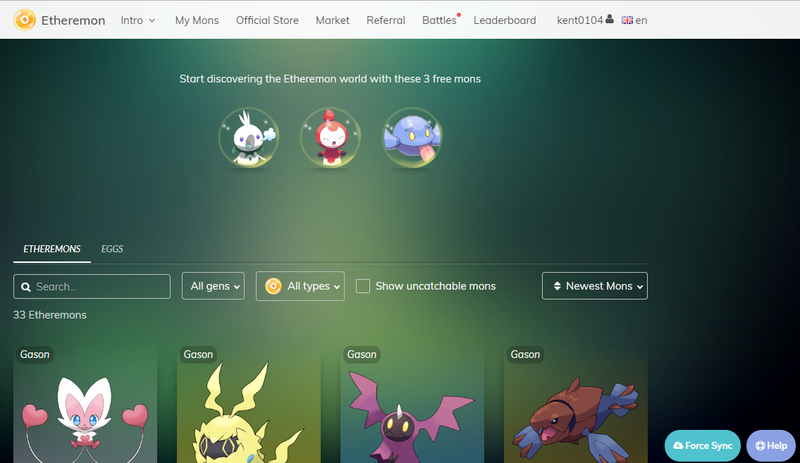 You can view all your Etheremons under the “My Mons” tab. Each monster can be 1 of 3 types. Each type of monster has a special advantage and disadvantage as compared to the other types. You can see whether each monster can evolve or lay eggs by clicking on it. You can even put your mons up for sale or rental on the market, or transfer to your other wallet. In the Etheremon world, everybody uses Emont as currency. You can use it when buying and selling within the game. It is an ERC20 token that is transferable and limited. Etheremon currently has 3 battle modes: Gym, Practice and Ranked. The Gym mode lets you train your new monsters so that they gain more experience. The more experience they have, the more likely they will win in battle. You can train your monsters from level 1 to level 10. The higher the level at which you train, the more experience points you gain. The Practice mode is unrated, which means you can test your strategy for ranked matches while gaining experience points. First, you will need to form your team of exactly 3 attackers and up to 3 supporters. Then, attack up to 5 teams at once. In the Ranked Match mode, you can battle other players for experience points and Emont in a race to the top. You can form your strongest team and see if they can beat the competition. Each attack costs you 2 energy and you recover 1 energy per hour. You can fully recharge your energy to 80 at any time. Once the battle transaction is successful, you can check your battle history for the result. Joining the battle will help your Monsters gain experience and level up. Here’s the most exciting part: Adventure Mode. At the beginning, there are 2 ways to play in Adventure Mode: Exploration and Challenge. Players can send their monsters on random explorations to collect rewards at different sites. Ether Monsters can explore the sites in 30 minutes to 1 hour. Don’t worry; they are smart enough to return to their owners after the exploration with collected rewards and a photo of the visited location. In addition, you can challenge the site hosts’ gym-guarding monsters. Ten site hosts in each Adventure site will assign 1 monster to guard their gym. First, your monster must explore that particular site to locate a gym before challenging the site hosts’ monsters. In each challenge, 5 out of 10 guarding monsters will be selected randomly to compete with your monster in 5 battles. Your monster will gain EXP for each battle. If your monster is tough enough to beat all 5 guarding monsters, you will receive a reward. The Etheremon world contains a total of 108 exploration sites. This number is fixed and can never be changed. Of the 108 adventure sites, only 54 will be open for auction to the public as of now. The other 54 will not be released in 2018 but instead are reserved for future development, according to the Etheremon team. Each site is limited to 10 hosts. The hosts will share their site’s income equally for letting players’ monsters visit their site and collect items and rewards. Adventure Mode is expected to be released in the third quarter of 2018. Overall, Etheremon’s game features are pretty interesting. Etheremon is one of the first decentralised games based on the Ethereum network. Since the game’s launch in December 2017, the developer has added more gaming modes in which players can battle with their Ether Monsters. The first version of the Etheremon VR will be introduced in 2019. It is expected to gain more exposure and a growing community in the future. About Kent Chong — Kent is a freelance writer specialising in the equities market. He is also interested in blockchain technology and cryptocurrencies.